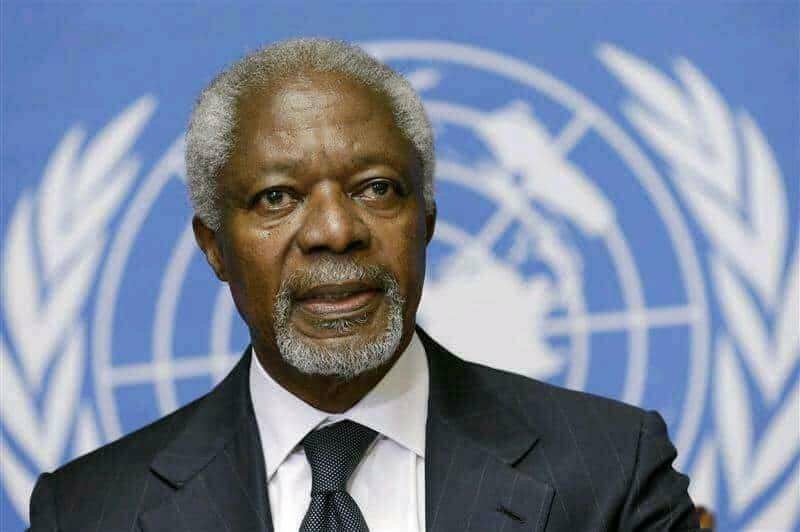 Kofi Annan: His Death, SCNC, Biya, The West And Ambazonia. We have received news this morning of the passing away of Kofi Annan, a son of Ghana and Africa, a statesman of the world. We salute the memory of Kofi Annan who personally achieved many things, including recognition as a Nobel Peace laureate in 2001. Kofi Annan brings up many memories for us. He worked for a negotiated settlement of the Bakassi conflict. Our forerunners in the struggle lobbied him intensely on case of the annexation of Southern Cameroons by La Republique du Cameroun. Mr Annan even visited Cameroun to discuss our situation. His advice to Biya to initiate negotiation failed. Being a son of Africa, Annan hoped that Paul Biya will work with the SCNC and other groups to adjust the state peacefully and resolve the root cause of the problem. But he left and nothing changed. Biya duped him. Biya promised him that dialogue will ensue and Mr Annan played his own part of the bargain to not criticise LRC much, to give Cameroun the chance to fix its mess. Lai lai to lai lai, nothing happened. Biya pretended to listen. He ignored him. But sadly too, Kofi Annan had failed to learn from his past failure. As Under Secretary General of the UN in charge of peacekeeping operations, Annan had failed to stop the Rwandan genocide, in which 800,000 Tutsis and moderate Hutus were murdered in 100 days. Mr Annan was also in charge when 8,000 Moslems were massacred in a UN safe area by Serbian forces. Mr Annan was to some extent let down by the West. But he did publicly recognised that he could have done more to prevent those dark moments from occurring in our world. Fast forward two decades. Successive batches of UN and world leaders have failed to address the case of the Southern Cameroons. Here we are today – in conflict, our people being murdered by troops loyal to the man whom Kofi Annan trusted, our women being raped, a genocide developing in our land, hundreds of thousands of our people displaced. Biya scammed Kofi. Unfortunately, the story of this bloody struggle would be insincere without stating the obvious failure of the one African who held the office that could have saved our people from this mess and also preserve the husbands of the several women who are now widows on LRC’s side. The people of #Ambazonia #SouthernCameroons should take the hint from Mr Annan’s quote above. As we mourn a great statesman of the world, a son of Africa, the world should seize the opportunity to examine one of the burning issues where they failed to empower Koffi to resolve the annexation of Southern Cameroons Ambazonia by Cameroun which has now turned into conflict and Africa’s fastest growing humanitarian crisis. Biya duped Kofi. We hope Antonio Guttieres will reflect on this. The independence of Ambazonia is non negotiable. Kofi Annan is one of Africa’s finest. He is from Ghans, just look at how Ghana is stable, developed, advanced, democratic, … then look at LRC. We are dealing with people whose consciousness are apart in galactic proportions. LRC is an example of an African nation that is ruled by illiterates. They are still suffering from an inferiority complex towards western nations and people. The politicians of LRC think their duty is to please western nations. They still don’t even have an idea that western nations are so far advanced psychologically that when they, these LRC leaders go to them and try to show that they admire them, they are only reacting not to the admiration for they don’t need it, but are only showing pity for their sorry LRC asses. We will never forget Kofi Annan and what he achieved.